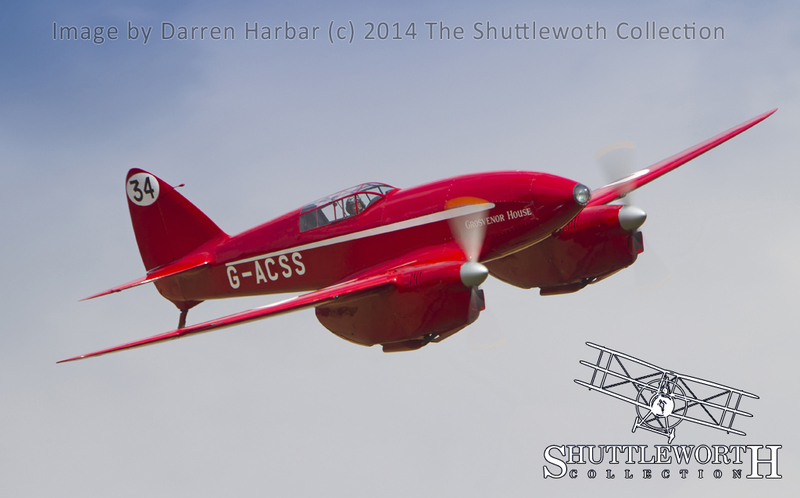 As reported on Friday, August 1st on Global Aviation Resource, the Shuttleworth Collection’s de Havilland DH.88 Comet (G-ACSS) is now flying again. The classic 1930’s air racer made its first flight in nearly 12 years, taking off from its home base at Old Warden in Biggleswade, Bedfordshire. deHavilland designed, built and flew the sleek twin in just nine months. They built the aircraft exclusively to fly in the MacRobertson Air Race between London, England and Melbourne, Australia in 1934. The Comet is a design that looks fast from any angle; its two six cylinder de Havilland Gipsy engines capable of pushing it up to 237mph over long journeys which was a significant achievement at the time. The aeroplane presents a striking profile. Its slender, 29ft long, spruce plywood fuselage and graceful 44ft wingspan give it a timeless beauty. The long nose concealed the main fuel tank for the transoceanic flights it needed to achieve. deHavilland built three Comets for the race, and two further examples afterwards. The Shuttleworth Collection’s example, registered G-ACSS, bore the name “Grosvenor House” in honor of Mr. Albert Edwards, the aircraft’s sponsor and Managing Director of the Grosvenor House hotel in Mayfair, London. Charles William Anderson Scott, AFC and Tom Campbell Black flew “Grosvenor House” to victory in Melbourne, and arrived back at Mildenhall, England just 13 and a half days after leaving Australia on the journey home. She broke several records in the process, one of which stood until 2010. Of the three Comet’s, only “Grosvenor House” finished the race. The RAF acquired G-ACSS for evaluation following the race, where she gained the serial K5084 (just thirty digits from K5054, the Supermarine Spitfire prototype!). After several incidents in RAF hands (she had some notorious handling characteristics) the military sold G-ACSS on to a civilian owner. Essex Aero Ltd. of Gravesend refurbished the Comet and she went on to participate in the England to Damascus Air Race of 1937, coming fourth. This historic racer achieved further fame setting new records for flights to the Capetown, South Africa, and a particularly impressive England-to-New Zealand round trip journey which the Comet completed in just under 11 days. The Shuttleworth Collection acquired “Grosvenor House” in 1965, and spent the next two decades slowly restoring her back to health with significant help from British Aerospace, deHavilland’s successor company. She emerged from the restoration to make her first flight on May 17th, 1987, taking off from her original factory aerodrome at Hatfield for the first time in 49 years. 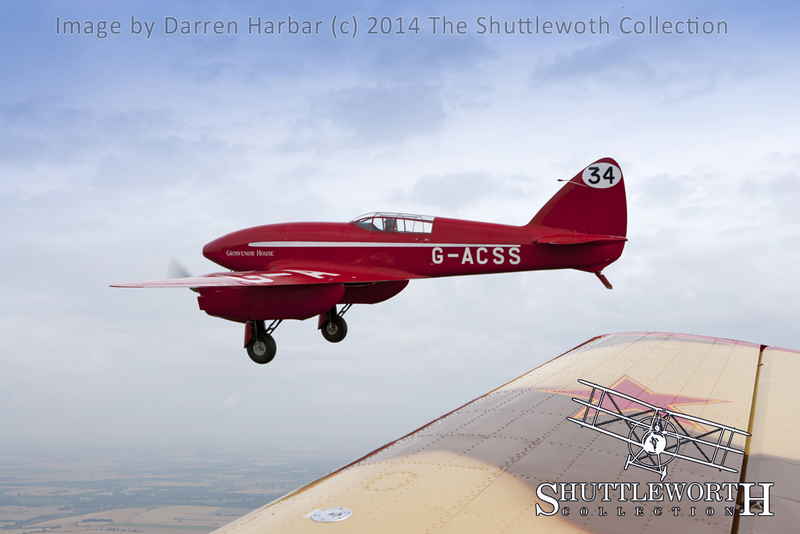 The Shuttleworth Collection based the Comet at Hatfield until British Aerospace closed the airfield in 1994. The aircraft had to make the journey back to Old Warden by road, where it remained in taxiable condition for several years. She flew just once during that time, on October 28th, 2002, in the hands of George Ellis before a landing incident damaged the undercarriage. 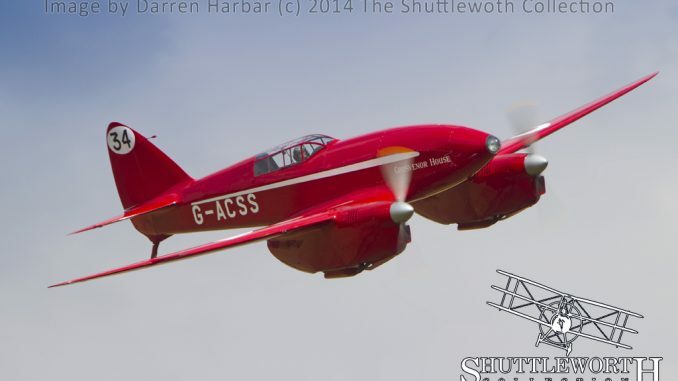 Since then, the Shuttleworth engineers have repaired the Comet and have been modifying the undercarriage to rectify some design issues, which necessitated gaining the required CAA approvals, with the support of the Light Aircraft Association. Shuttleworth’s Chief Pilot Roger Bailey took the Comet aloft from Old Warden for two lengthy and successful test flights this past Friday. It seems fitting for the Comet to fly again this year, considering the approaching 80th anniversary of the type’s first flight and the MacRobertson Air Race in September and October respectively. WarbirdsNews congratulates all at the Shuttleworth Collection for their hard work in returning this magnificent aircraft back where she belongs, the sky. For more pictures and the complete article visit www.globalaviationresource.com.